As I mentioned at the end of my last post, Jamie and I were starting to get somewhat hungry after searching out and photographing several North Shore lighthouses - especially considering that we hadn't eaten breakfast! Leaving Marblehead, we drove back over towards Salem in the direction of Peabody as I was thinking that a trip to the iHop there might make for a nice late breakfast/early lunch. I do enjoy a good pancake from time to time but unfortunately there are no iHops anywhere close to Norwich so to get to one, a drive is always in order. I knew there was one close to Salem as Amanda and I had gone there last year after her Open House visit to Montserrat. What I hadn't counted on was the fact that it was the last Friday before Christmas Eve so when we drove over towards the iHop which is located near the North Shore Mall, the traffic just kept getting worse and worse and worse. It didn't help that there was some sort of highway construction on Route 128 that was prompting people to get off the highway near the mall and bring traffic to a near standstill. Once I was able to negotiate my way out of the line of traffic I was sitting in, we gave up on the idea of going to iHop and I pointed the car back towards Salem while Jamie and I came up with an alternate plan of action for lunch. I actually did have a place in mind that I had seen when driving into Salem on Wednesday that looked suspiciously like it was located in the Old Salem Jail. I had asked Juli about it when we were having tea on Thursday and she said that yes, there was a restaurant there that they had opened just recently that was still getting their footing. 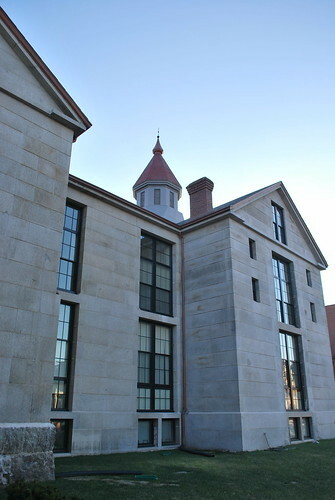 I was quite impressed that the City of Salem had gone to the trouble and expense to restore and renovate the building where the old jail was located as I remembered from the ghost tour that I did back in 2008, that the Old Jail was said to be one of the most haunted buildings in Salem. Juli said that the goal was to renovate the building but maintain its history and she said that they had done a very nice job; in addition to Great Escape - the restaurant - the building now holds 23 luxury apartments that will eventually become condominiums and available for ownership. The Old Salem Jail, which once housed captured British soldiers from the War of 1812, didn't close its doors until 1991 making it one of the oldest continuously operating jails in the country. It was quite the busy jail, too, with six prisoners to a cell and hangings being held inside the actual jail rather than outside. 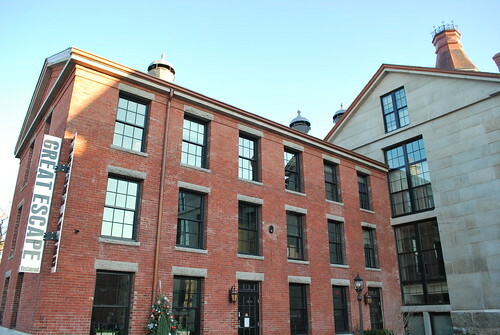 The complex where it's located contains the main jail building, an imposing granite and brick structure built in 1813 and renovated in 1884; an 1813 jail keeper's house; and a barn which also dates back to about 1813. Additionally, the jail complex sits next to Salem's Howard Street Cemetery which is rumored to be Salem's most haunted cemetery as it's the burying place of Giles Corey, one of the unfortunate victims of the 1692 Salem witch trials who was pressed to death after refusing to have a trial. Once we decided that we'd check out the Great Escape for lunch, the problem became one of figuring out how on earth to actually get to the restaurant as parking is pretty much non-existent and there are no signs directing you in. I circled around the block a couple of times before I finally figured it out and managed to find a parking space next to the courtyard in front of the restaurant. The courtyard, where customers can dine when the weather is nice, is made of granite slabs from the jail's original floor that were cut into 4-inch slabs. It looked like it would be a nice area to sit and enjoy a meal but definitely not on the day that Jamie and I were there as it was pretty breezy and darned cold to boot! 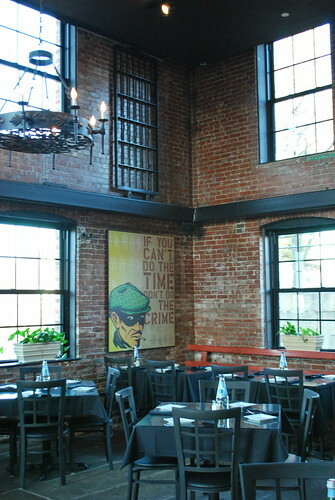 The inside of the restaurant has maintained the history of the building and is a very high-ceilinged open space with granite floors, brick walls, and old cell doors that break the dining area into sections. 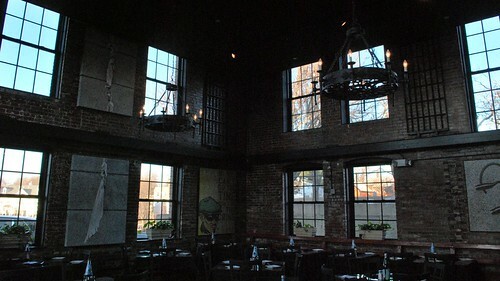 The tables and chairs were all black as were the booths and there were lots and lots of big windows. LOTS of windows! As it was after what is considered to be the normal lunch hour, the place was pretty well empty except for a table of six people who seemed to be thoroughly enjoying themselves, Jamie and I had our pick of pretty much wherever we wanted to sit so we opted for a both near the back of the restaurant from which we got a good view of the whole place. Not wanting to disturb the other folks who were there, I kept the flash off on my camera so some of these pictures are a little bit dark but it gives you a good idea of what the restaurant looks like. It's not big by any stretch of the imagination and only sits I believe 70 but I liked what they had done in keeping the furnishings minimalist to add to the ambiance of being in an old jail. Oh ... and those green spots in the pictures? No clue what those are! At that point we were both getting real hungry so we were quite delighted when our waitress brought us some of THE best rolls and dipping oil after we had placed our order. If you've ever had the rolls at Bertucci's which are fantastic you'll know what I'm talking about but these were better! Crusty and warm and yeasty ... perfect! As a matter of fact, we ate them so quickly, it never even dawned on me to take a picture though I did get a shot of Jamie after she'd eaten her share! Even though the rolls were very, very good, she was still hungry and anxiously awaiting the arrival of her chicken sandwich. If I had been thinking I would have written down the names of what we ordered as the menu has clever names for things like you'd expect to find in a jail-themed restaurant - Al Capone pasta, Scarface shrimp, KGB & CIA scallops & salmon ... that sort of thing - but alas, I can only call it what it is - a grilled chicken sandwich for Jamie and bacon-cheeseburger for myself. My burger came with a small salad that was absolutely delicious and which I had practically swallowed whole before it dawned on me that I was eating blue cheese dressing - and I hate blue cheese dressing! Or at least I thought I did! The salad came with a big chunk of blue cheese that I happily gave to Jamie once I realized what it was (you can see part of it behind the burger bun) as well as waffle fries like Jamie's. The only complaint I might have had about the food was that I like to have my burger cooked medium well and this one was a bit more pink than I would have preferred but to be honest, the meat was so fresh that it was really quite delicious the way it was so I didn't send it back to have it run through the fire again. Our sandwiches were quite filling - trust me, they're huge! - but Jamie had her heart set on dessert so we ordered a slice of cheesecake and split it. 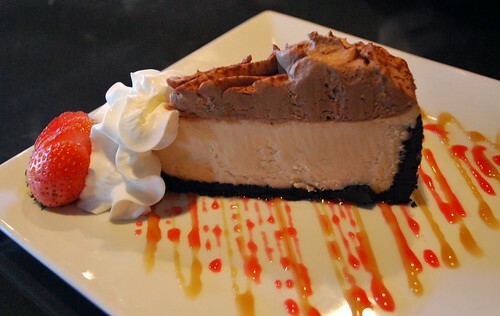 If memory serves me correctly it was a Kahlua and Bailey's cheesecake but again, I didn't write it down and I could be wrong but no matter what it was, it was yummy! When the waitress dropped off our check (and I've never ever understood why it's not called a bill instead! 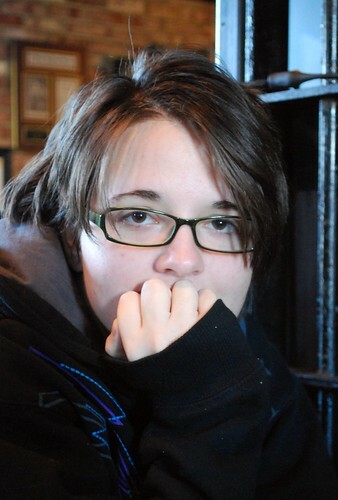 ), she asked if it was our first time there and I said that yes, we were from Connecticut but had seen the restaurant and knowing that it was formerly the old jail I had really wanted to check it out. 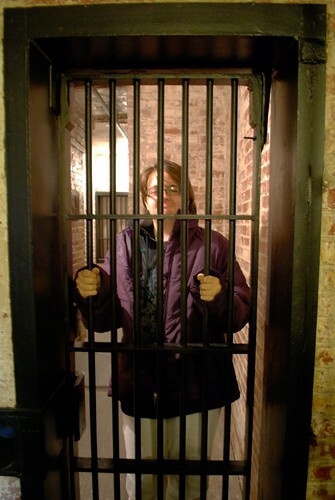 At that time, she offered us a tour of the cell that was retained and renovated as part of the building. Really? Cool! 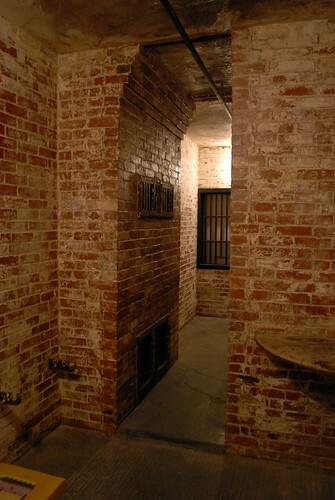 The cell is located on the second floor in the residential area of the building near the main front door entrance where I suspect residents pass by it on a regular basis. It's narrow but rather deep and seems more like two cells than one but it wasn't all that big when you got right down to it. According to our waitress/tour guide, there were six men assigned to each cell and there was no running water so they had to use a bucket as a bathroom. Ew! It was easy to see where there were hooks for four bunks on the walls but even our tour guide wasn't sure where the other two men would sleep. Once we were back down in the main dining area, I couldn't help but try to take a picture of the moon rising over the trees that are in the Howard Street Cemetery through the jail's window as it just looked too cool not to! All in all, the food was quite delicious at a reasonable cost and I thought it was a very ingenious use for the old building. I think it's great that the folks in Salem sought to restore the old buildings rather than to tear them down and I would totally love to live in one of the apartments there - haunted or not! - but alas, it's kind of a far commute from Salem to Norwich! Speaking of which, it was time for us to head over to Beverly to meet back up with Amanda and then head back to Norwich after her semester review was complete which also meant that our mini-break to Salem was over. All in all, I had a wonderful time and got to see and do a lot of things that were so "right up my alley" that there was no way I wouldn't have enjoyed our time there. I'm pretty sure I'll be going back again as I've got a pretty good idea that I've only scratched the surface of Boston's North Shore which is chock-full of history and definitely my kind of place. I guess I should warn you that there will probably definitely be more posts about that area in the future! And who knows? I may have a ghost story to tell the next time! The Great Escape. What a cool name for the restaurant! And on the whole, what a cool place! I would break my "I ain't goin' to jail for nobody" rule, seeing that it's a former jail now. I'm with you. I hate that old buildings, which were built far better than any of those built today, are torn down rather than repurposed. Bravo to those responsible for saving the jail and preserving its history. 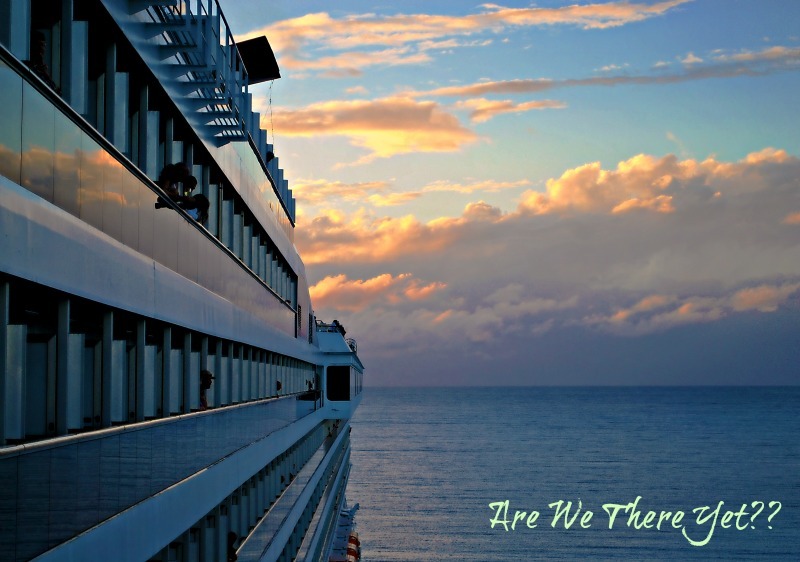 Thanks for taking me along. I loved it! You know what I was thinking? If nobody is smart enough to hire you as a photo journalist, why not just go ahead and self-publish your own books? Even your blog can be printed into a book. And there are tons of self-publishing companies nowadays who do that sort of thing. Take blogging to the next level. Look what happened to the guy who wrote Sh*t My Dad Says with his Twitter account! Seriously my friend, people would pay for this if it were made available to them... and then you'd be rich and famous! Jamie's sammie looked super-delish. and Blue cheese dressing on a pink cheeseburger? Pure heaven for me. bring. it. on. There's a place in Lawrenece, Kansas that is a good lunch spot that used to be a bank. I think the bank went back to the wild west days. They tried to keep the old bank thing. 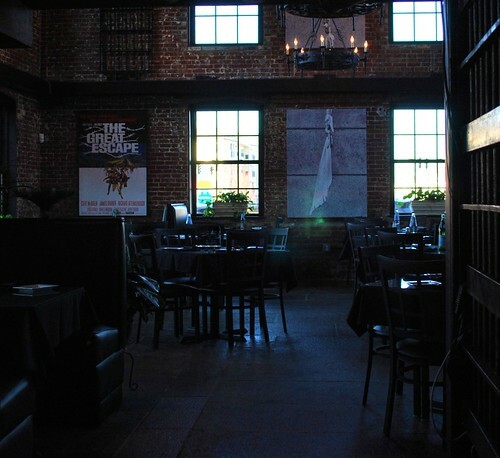 I love how The Great Escape kept the charm of the historic building. I *love* that huge chandelier! The iron/chains thing fits well with the jail theme. 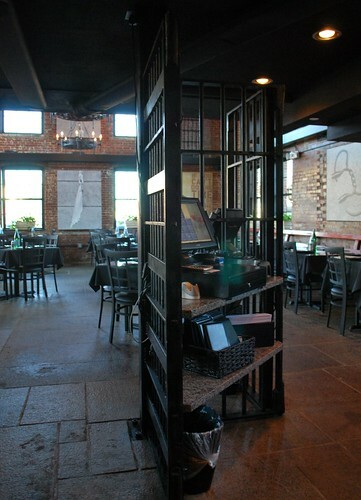 How cool to eat in a jail! 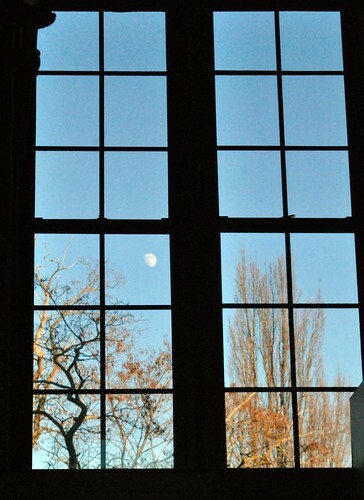 Really love that moon pic through the window panes, very original. oh how very cool and the food looks great too. i love your adventures! 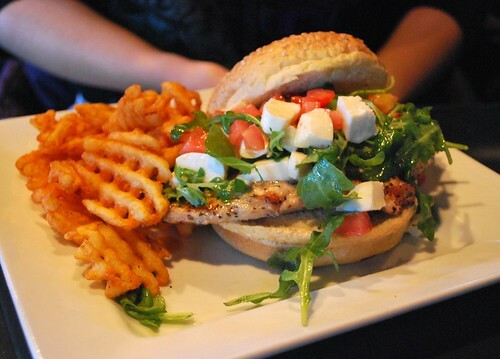 Wow the food looks really good. I love blue cheese dressing. Yummy. I think my arteries clogged a bit though looking at the pictures of the food. 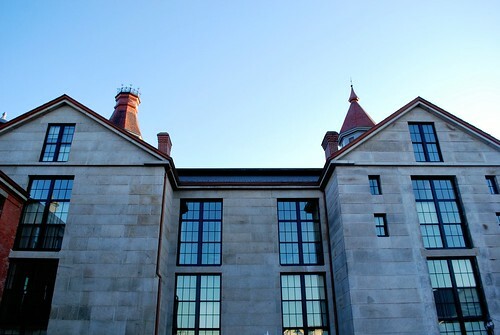 I love what they did with the old jail. Not sure I'd care to visit as I spent 25 years working in one. Just saying. What a fun trip you had. I've enjoyed tagging along. Love the names and the repurpose of the jail, keeping all the jail motif throughout. Smart. Boy does that food look. I'm drooling. 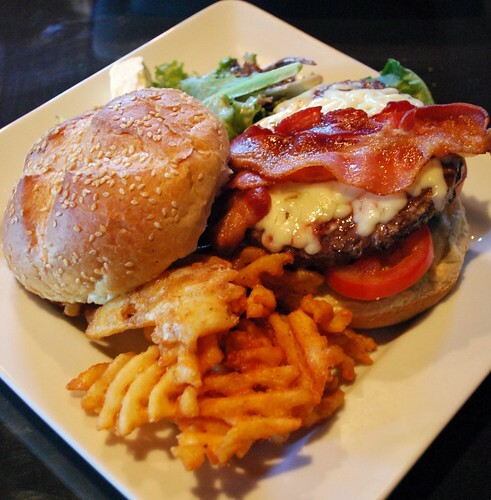 That is a gorgeous looking burger! I hope Jaimne was let out after. What a cool building for a restaurant. And the food looks fantastic. I always say, if you're gonna make a burger than make a big ole burger! Cool!!! Another epic extremely well done. I think the folks that bought the jail and are using it as a restaurant really found the sweet spot. And if they keep the food at the same standards, they'll be rolling in the big bucks. I know you don't think you've "got it" but you do, you really, really do - and I think you should follow Barb's advice! Beautiful pictures and the one fairly closeup of the kayaker could probably be sold to a sports equipment purveyor for their sales brochure.